The Society has over 14 miles on the river Trent, over 2 miles of tidal Trent aswell as 2 miles of River Derwent - near Matlock. We have the only fishing on the River Greet. We have over 90 acres of coarse fishing, comprising of 6 different lakes. Including a seven acre trout lake holding Rainbows, Browns, Blues and Tiger Trout. Our waters have been described as some of the best stretches of the best Barbel river in the country. These include long stretches of deep, navigable Trent, as well as several miles of the 'Old River Trent', which is non-navigable. The Old River Trent has hidden pools, natural weirs, fast gravel slides and deep runs with overhanging trees. These waters are home to many species of fish including large Barbel, Chub, River Carp, Bream, Roach, Dace and predators such as Perch and Pike. Seven out of the top 10 match weights in the 2018 Division 1 National (including the top 3) were caught on NPS waters. Check out the Day Ticket Section for further information. There are three stretches which are bookable for visiting matches (Fiskerton - Rolleston & East Stoke). Two which offer Day Tickets fishing (Fiskerton & Rolleston) and one which enables non members to apply for a Guest season ticket, on part of the famous East Stoke stretch. The society also runs annual events and guest speaker evening which are open to non members. The Society was founded in 1891 by a small group of Nottingham gentlemen. In the early years the Society had waters around Nottingham itself as well as some of the waters that we still have today at Averham, Staythorpe and Rolleston. 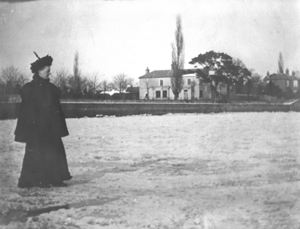 Those were the days when the Trent occasionally froze over. Membership was quite small at the start but by 1916 it had grown to 160 (and today it is in the region of 750). Many famous Trent matchmen have been members over the years, but other famous people have been associated with the Society. One was Fred Kitchen, a music hall star, who was allowed to fish Society waters when in Nottingham. By way of thanks he presented the Society with the Kitchen Cup, which is still an important match on the calendar. 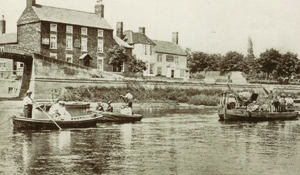 The river at this time would have been typified by scenes such as this one at the Bromley Arms in Fiskerton. In the early part of the 20th century salmon were still caught in numbers on the river. It is encouraging to note that they are now gradually being re-introduced. The rise of coal fired power stations made the fishing particularly good in winter, but even so, over the years, the fishing has changed tremendously. Chub, roach and dace almost disappear for 2 or 3 years before making a comeback. There is no doubt that the clean Trent of today is responsible for the return of roach and dace. However, it is the barbel that dominates today with fine specimens and all year classes present. When looking back it is interesting to see that many of the problems of yesterday are still with us today – poaching, otters, boating incidents, and so on. However, there is one relatively new phenomenon that has had a dramatic effect on the river – the cormorant. Flocks have devastated small fish populations. However, the river has a way of re-inventing itself and, as it does, so the Society changes in empathy.